Meenakshi, a bright 20-year-old from Mohammadpur village in Haryana, had been experiencing frequent bouts of tiredness, headaches and general fatigue — to the extent that even the simplest and easiest of daily chores became difficult for her to carry out. Though it was holding back both her undergraduate studies and her household contribution, Meenakshi did not reach out for medical help. A health worker in her area out to screen young women for anaemia was the first to infer that Meenakshi might have anaemia. Subsequent tests revealed her Haemoglobin levels to be 8gm, that is well below the normal range for hemoglobin for women, which is 12.0 to 15.5 grams per deciliter. Young girls and women like Meenakshi often live their entire lives with anaemia that goes unreported and undiagnosed. Anaemia can cause serious health problems leading to irreversible organ damage. 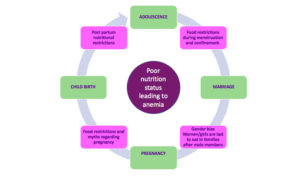 Anaemia is one of the most common preventable causes of maternal morbidity and poor health outcomes for the mother and child, like perinatal and neonatal mortality, low birth weight, and poor cognitive development. Women of reproductive age are most vulnerable to anemia due to recurrent menstrual bleeding and the demands of pregnancy and childbearing. Anaemia affects women adversely throughout their life cycle. According to the most recent National Family Health Survey (2015–16), more than half (53%) of India’s women are anaemic. Could gender disparity be the reason behind why women are the gender to suffer most from anaemia? This post explores the dynamics of gender interplay through 3 critical phases of a woman’s life-cycle — childhood, adolescence, and marriage and pregnancy. Anemia is often the result of a combination of health outcomes and social determinants, and it is important to understand the contribution of each in the life cycle of a woman. Iron and Folic Acid (IFA) supplements are not always enough to address the issue of anemia. In India, more than half (58.6%) of all children aged 6–59 months are anaemic. Anaemia increases the risk of child morbidity and mortality — and at present, one out of every twenty-five children below the age of one, and one in twenty below the age of 5, die every year in India (NFHS 4). Undernutrition is a major cause of anemia in children, and has the most detrimental effect during the development stages of a child. It retards her physical and cognitive growth as well as increases susceptibility to infection, which in turn further increases the probability of malnutrition. Undernutrition could also catalyse an intergenerational chain of poor health outcomes. For example, women with anemia are more likely to give birth to low birth weight babies, who in turn are more likely to be stunted and to develop chronic conditions in adulthood. Women are often given the responsibility for their child’s health, but not enough means through which they can ensure optimum nutrition for her. Moreover, healthy nutritional practices like breastfeeding are not encouraged outside the confines of closed spaces such as the home. The iron in human breast milk is extremely bioavailable (∼50% absorption) with the iron nutrient content at its highest just after birth, decreasing steadily over the course of lactation. According to a study conducted in an urban slum in South India, only 1/10th of all study participants exclusively breast-fed for 6 months, detrimental factors being poverty, education and lack of awareness. In India, 53.1% of all women aged 15–49 years are anaemic as compared to 22.7% of men. One reason for this is because women undergo recurrent loss of blood due to menstruation, and need greater nutrition to compensate. Inadequate nutrition during adolescence can therefore have serious consequences throughout the reproductive years of life and beyond.Very often, in India, girls get married and pregnant even before the growth period is over, thus doubling the risk for anaemia. This in turn leads to a variety of complications, including fatigue and stress on bodily organs, and anaemia during pregnancy increases life risk to both young mothers and babies. The difference in power between males and females becomes more visible as girls reach adolescence, particularly in terms of socio-economic determinants such as marriage at an early age, followed by discontinuation of education. NFHS-4 reports that 26.8% of all women aged 20–24 years were married before age 18 years, and 7.9% of all women age 15–19 years were already mothers or pregnant at the time of the survey. Very young age at marriage is a sign of gender asymmetries in power. Young age at marriage is then followed by young age at first birth, which tends to be bad for the health of both baby and mother as the mother is still a child herself. 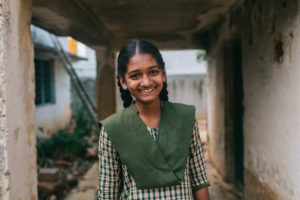 In addition, married girls are more likely to be taken out of school — which is reflected in the high average rate of dropout in secondary education in India, which is 16.88% of those completing primary school(MHRD). Women are made even more vulnerable in the immediate post-partum, menses and pregnancy periods, when they are regarded as ‘impure’ in some cultural contexts. They also have to follow certain customary food restrictionsdecreed by elders — for instance, restricting consumption of meat in Bihar or ragi and tubers in Karnataka — which again impacts young women’s nutritional status negatively. Pregnant women with anemia have the highest potential to encounter complications while going into labour and delivery. According to the World Health Organisation (WHO), one of the major causes of maternal mortality is Post Partum Haemorrhage (PPH), which is easily preventable. According to NFHS 4, 50.3% of all pregnant women are anaemic. Pregnant women need more nutrition than usual during pregnancy, but they are often unable to access correct and comprehensive information about how to look after themselves and their children. The reasons for this are often to be found in the social determinants. In some contexts, women don’t have access to medical counselling because cultural norms curb the rights of females to go to doctors, especially male doctors, unless accompanied by a male member of the family. In other cases, women are expected to follow the age-old traditions of the community regarding pregnancy, and knowledge about medicines and such are frowned upon by community leaders and family members. A study conducted in Turkey talks about how it is a common belief to abstain from eating meat, fish and poultry — all proven sources of Vitamin B12 — during pregnancy (Ayaz and Yaman Efe, 2008). 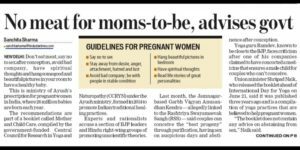 Another study conducted in Jaipur, India showed that 90% of the pregnant women studied were acting in accordance with pregnancy-related myths and rituals, which were enforced for women by elders of the family, especially grandparents (Choudhary et al, 2017). Women in many families also follow the rigid patriarchal system of eating meals only after the male members and children have finished. There is often not enough food left for the women — sometimes they might even starve or have only the leftovers. Men have the bargaining power to decide about food allocation because they are perceived as contributing most to the household budget (Griffiths, Matthews, and Hinde, 2002). Women’s weak bargaining position consequently results in little voice in decision-making around food, and differential feeding and caring practices favouring males. For more on social determinants of women’s malnutrition, see this post. We can no longer treat gender inequality and iron deficiency anemia as separate issues, since poor nutritional status in all its forms is both a cause and effect of power imbalance between men and women. The significance of family systems and values, practices, and gender dynamics as determinants of the health and nutritional status of women need to be addressed at the grassroots level. Such culturally rooted practices influence food and nutrition security and other developmental outcomes of individuals, households, and communities. 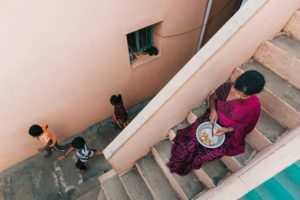 These norms take more than just awareness to change — they need to be constantly reinforced, and supplemented by other initiatives that empower women to participate in household decisions such as food selection and allocation in the family. A very good example of this norm change is that of UNICEF partnering with India’s National Rural Livelihood Mission (NRLM) to try and mainstream women’s nutrition initiatives, through women’s empowerment platforms under NRLM’s “Aajeevika” programme: In Andhra Pradesh and Telangana, 5100 women federations partnered with State Governments to provide 895,000 pregnant and lactating mothers nutritious meals daily through the ‘One Full Meal’ scheme. Another example is strengthening breastfeeding practices and provisions through appropriate legislation and incorporation into parallel development programs. Strengthening Health systems by addressing gender bias is not a new concept. Gender-sensitive programming holds the potential to solve some community-based issues by building communication and engagement that can help break down old power structures and societal constraints. For example, encouraging girls to complete their education before marriage delays the age of marriage, and hence age of the first child, which ensures better health outcomes for the mother and child. Success in achieving SDG-3 can only become a reality if gender mainstreaming, prevention of gender-based violence, and integration of culturally sensitive approaches are introduced in all sexual and reproductive health policies, programmes and services.